Yosemite National Park is one of the most amazing places in California. Each season the park changes and shows a different side of itself, with winter being one of my personal favorite times to visit. Here are some of my favorite things to do in the winter in Yosemite and let me know what I left off in the comments. Here is a video I made on Yosemite in the winter. 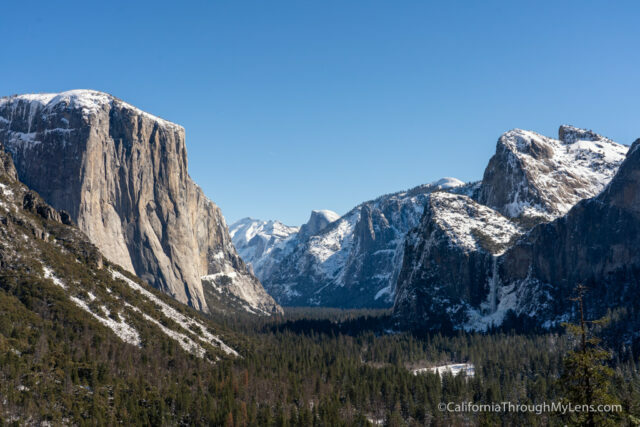 Tunnel View is the first thing most people see when they visit Yosemite Valley from the south entrance. It is easily one of my favorite views in all of California and even though I have been dozens of times, it Never fails to take my breath away. 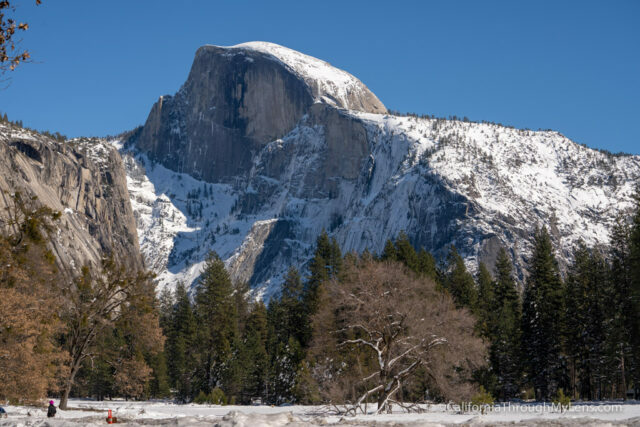 In the winter is particularly special since the mountains and half dome are covered in snow. Plan to spend some time soaking it all in. 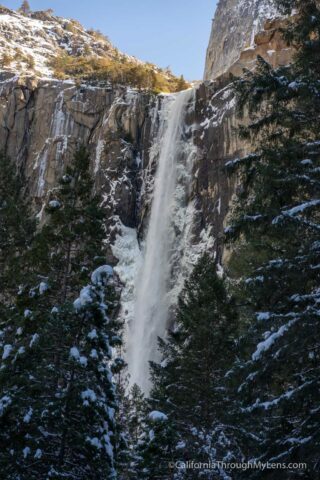 Bridalveil is one of Yosemite’s most popular waterfalls and one of the easiest to access in the winter. You can see the waterfall from the parking area, or you can take the short quarter mile trail up to the viewing platform to get a better view. Its a nice short walk in the winter. Read more about Bridalveil Falls. Next up, you can either drive or walk around the valley to explore many of its best quick stops. First, on the drive in you will get some great views of El Capitan towering in front of you. Next up, you can park near Swinging Bridge and walk across for some good views of the valley and Yosemite Falls. 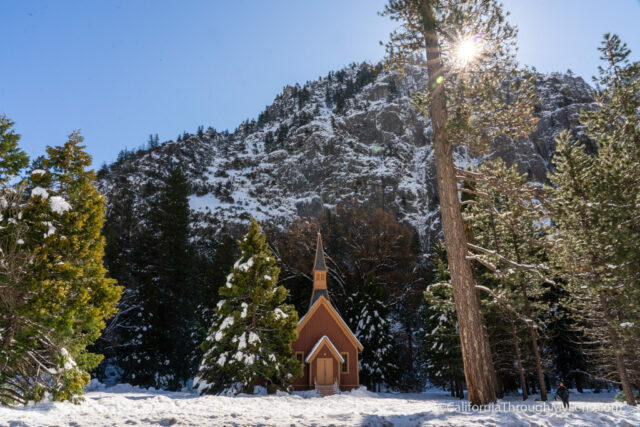 Lastly, you can park and explore the picturesque Yosemite chapel for some great photo opportunities in the snow. These are just a few of the quick stops you can do. 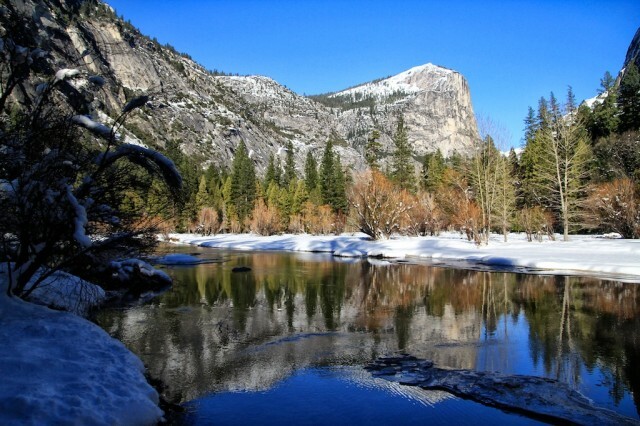 In the winter, Mirror Lake is one of the longer hikes you can take in the valley. You can’t park near it, so you need to take the shuttle, but the flat road that you hike is nice when it’s covered in snow and along the way it gives you some great views of half dome. At the end you may see the lake if it is not frozen over and covered in snow but even if it is there are still some amazing views from back there as well. Read more about Mirror Lake. Yosemite Falls is the tallest waterfall in North America and an amazing place to see in the winter. The falls are usually flowing well and there is a good chance there will be snow and ice surrounding the water. 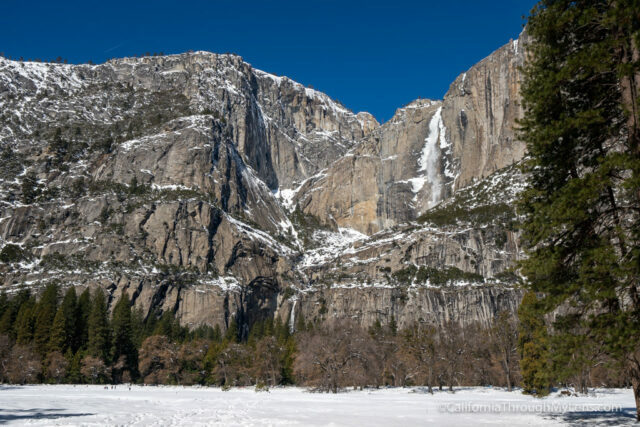 Just walking to lower Yosemite Falls gives you amazing winter views as well and it is easy to do since the walk is pretty flat. If you are there in the winter and a lot of the snow has melted you may even be able to climb to the top of Yosemite Falls if you want to, I have another video on this that you can watch in the comments. Read more about Yosemite Falls. If you are a fan of photography then you have no doubt heard of Ansel Adams. There is a gallery dedicated to him in the valley that I love exploring and next to it is the Yosemite museum which is dedicated to the native people who lived in the valley. It has some small exhibits inside and then some larger exhibits outside. 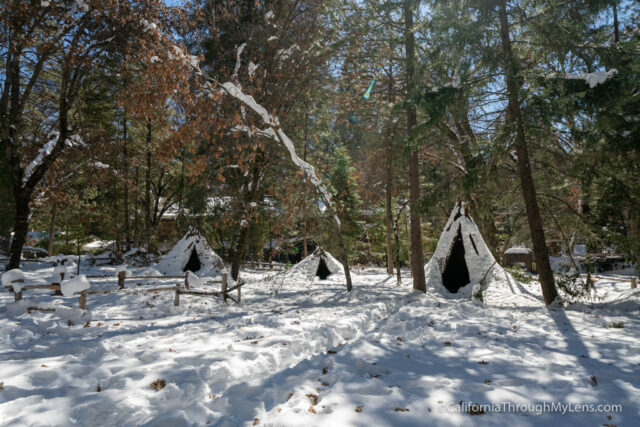 It is not plowed outside in the winter but it is still pretty cool to walk through the snow and to see how the teepees fair in the winter weather. Cooks meadow is one of my favorite views in Yosemite Valley. This meadow is right next to Yosemite Falls and it provides amazing views of half dome and of Yosemite Falls through the trees. If you have the chance come here for photography, especially at sunset. My last recommendation is to do some snowshoeing. If you have your own snowshoes you can explore the valley with them to your heart’s content. However, if you can get up to badger pass, they rent them there and you can take them on the 7-mile trail to Dewey Point. This is a tougher hike for many people but if you are up for it it does give some amazing views of the valley below. Read more about Dewey Point. 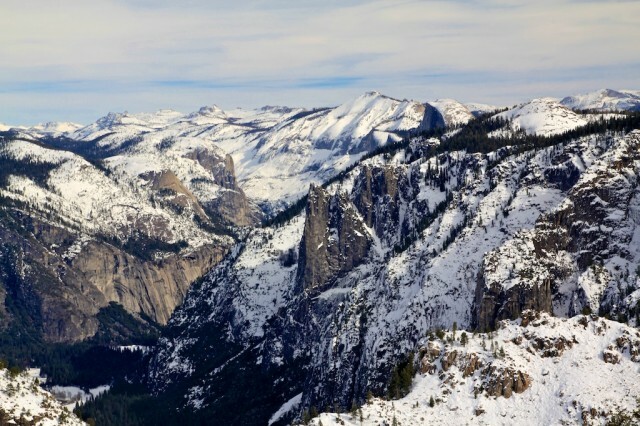 That’s it, my recommendations for what to do in the Yosemite Valley in the winter, let me know what I left off and if you are interested I will make a summer one of these later this year.